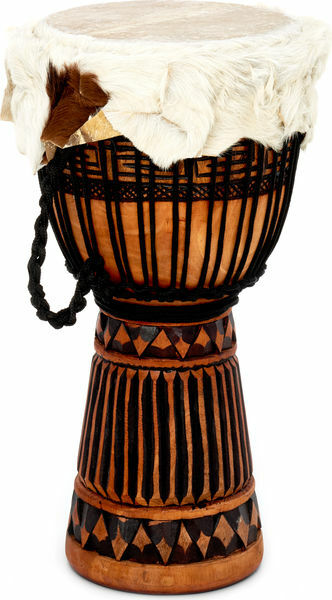 I bought this djembe because of the price, feedback and position in the "league" table. First of all, do not be deceived when told this drum is tuned and ready to play......it is not! Mine sounded like a tin dustbin lid; the base, tone and slap were indistinguishable and a truly awful sound. My teacher tuned it up for me and NOW it sounds like a really decent djembe. Second, in case you are expecting darker wood, the wood has been stained and is not naturally dark. Mine came with some scratches on (I don't mind that) and I plan to sand it back a bit and oil it to protect it. I will also put an old bicycle tyre around the bottom to stop the wood splitting in case of undue stress. It's beautifully light so easy to carry. I trimmed off some of the goat skin and vacuumed the rest (it moults a lot). The surface, although shaved, needs sanding to get a smoother finish. I've played three djembes regularly and tried out a fair number. This one I have bought, having been tuned and tweaked, is now really lovely and I'm very pleased with it. ohh well, it's a very good djembe that one of the best in terms of price + quality I ordered on this website. 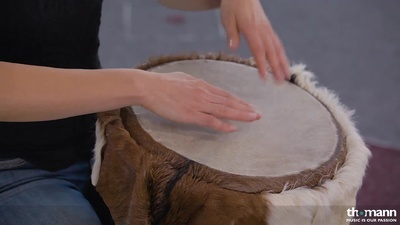 This is very good quality djembe is made. He had beautiful skin, which gives excellent sound for solos and for the rhythmic patterns. 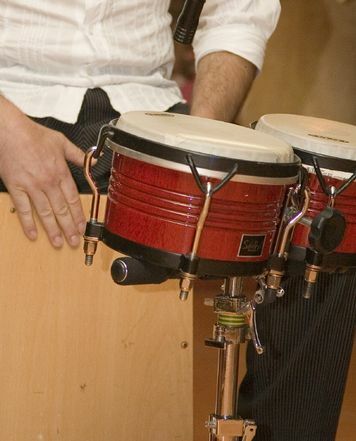 I am very glad to hear that sound when I take the hands to play this drum. He has a high and clear slap. Distinct and light tones. And powerful and booming bass. While the bass is still not such as bass djembe. But this decent bass. Although I would have carried it over to a solo instrument. Always happy packing box for mail! Guys from Thomann not spare any packaging material or boxes to send! Just great! ID: 230405 © 1996–2019 Thomann GmbH Thomann loves you, because you rock!